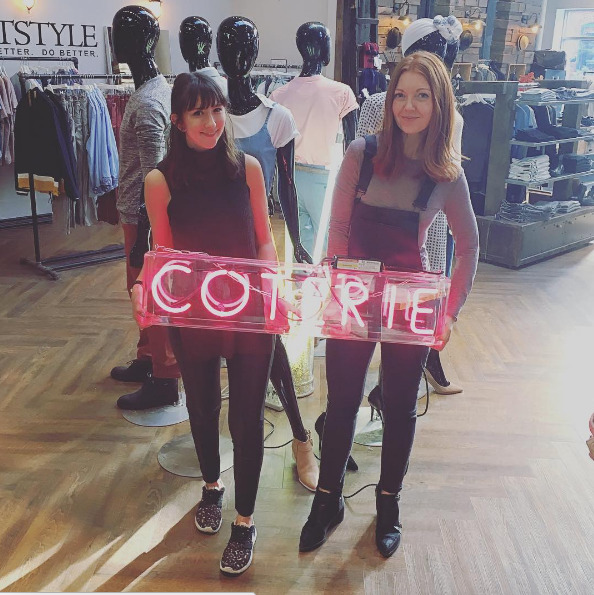 Gotstyle Woman Goes To New York! UBM Fashion has created one of the largest fashion trade shows in North America. It's housed in the Jacob Javits Center and it brings together the world's most influential brands in footwear, accessories and fashion apparel. This year, our womenswear buyers headed to New York for this amazing event in search of the best trends, brands and pieces to bring back home to our clients. To say it was overwhelming is an understatement. It was 3 floors of fabulous fashion, tons of people also trying to navigate it and use the same wifi. Here's what we saw, we did and we ate! Impressive light packing by two fashion girls - we only used carry ons! The size of the signs were just a glimmer at how big the show was. Not only did we discover new brands but we returned to old favourites as well! One of the things we were hunting for was exciting sweaters. 525 America seemed to bring what we were looking for. What types of sweaters do you want to see for next season? Lots of Checks, Plaid, Embellishment and pops of Red are coming for Fall. Velvet, Burnt Orange, Ruffled Sleeves, & Stripes will also be sticking around for next season. L'esquina from the outside looks like a typical street scene in New York. Inside you are led through the kitchen and into the magic that is this bar/restaurant. Tacos and Tequila what more do you want? Pizza is a food group at Gotstyle, so to have the chance to eat at one of the top pizza places in New York was a dream come true. Rubirosa is a must attend, this was the SMALL size of pizza and we ate every last bit it was so good. Check out this new hotel in Soho, it is dreamy!